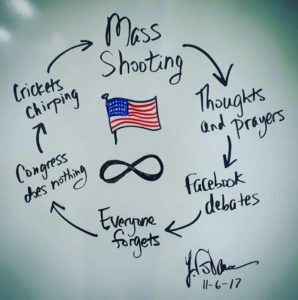 Home Activism Why the recent school shootings go beyond “Mental Health Issues”. I grew up in neighborhoods similar to the one’s i’ve seen in Parkland and Coral Springs except it was on Long Island. When Colombine first went down which was the first of these types of shootings, I became more observant of the bullying that occurred in my school on a daily basis. I observed how things built up. The bullying and overall social structure we have in our HS’s and society is very conducive to having these things occur. That’s just the bottom line. The tragedy of so many young lives lost is horrible, yet understandable. Don’t be misconstrued, this is not an UNFATHOMABLE thing. To think that it is, is simply being out of touch. So am I saying be nice to people and be aware of your surroundings in fear of getting shot? No, I’m saying be nice to people bc it is the right thing to do. When you’re that young, the tiny world that you live in is all you know and in the land of haves and have nots, desireables and outcasts – it is not pleasant to be one of the ostracized. Unfortunately this starts at the top. Parents teaching their kids that they are better than others, children carrying a sense of entitlement boasting about their possessions, vacations, etc are a commonplace, ESPECIALLY in those types of areas. A lot of attention is given to underfunded schools and what goes on in those areas, drugs, gangs, etc… Yes, bad stuff, but we have ENTIRELY DIFFERENT issues in these more prosperous or “nicer” areas. This isn’t to say either neighborhoods issues are better or worse, but the TOXICITY that goes on and is created in these schools cannot be underestimated. And that is exactly what is happening. I saw it when I was in HS and obviously we are all seeing it today. We have issues comprehending emotions and the effect of our actions. Jealousy and envy run RAMPANT in these hallways everyday and to some of these kids, their lives must seem like an endless tunnel with no light in sight. TOXICITY that goes on and is created in these schools cannot be underestimated. And that is exactly what is happening. So am I saying be nice to people and be aware of your surroundings in fear of getting shot? No, I’m saying be nice to people bc it is the right thing to do. And that needs to be taught. And there are a number of ways to trickle that down to our children and it can all start with the curriculum we teach in our schools. What type of frequencies do negative emotions create? Subjects that are not even an option these days would be created. They don’t need to be exact sciences. Science and what we know about it changes everyday. We have issues comprehending emotions and the effect of our actions in this society, so we need to start pointing the finger at ourselves, which will allow us to begin analyzing the little things. The things we don’t think that matter. It’s called attention to detail or critical thinking. Do you practice it?! My point is that we have fundamental issues in our society that until they are properly addressed – which we are FAR from addressing right now – these things will continue to happen on both smaller and larger scales. How can we change them? For us adults there’s not much we can do as bullying is a thing of the past. For those that are parents? Much much more. Being active in our communities and participating in events such as the PTA for example, is no longer just an option if you have children. We must start treating everyone in our communities – even other parents – as parts of our extended families because we are all in this together and until we realize this, nothing will change. It is funny how only during times of need and desperate struggle, ie. hurricane Irma, the NYS blackout back in 2003 do people come together, but the second these hardships are overcome we all run back to our busy little lives. We pride ourselves on being busy and not being about to reach out to others. So, last thing…. Should guns be more difficult to obtain? 100%. How pro gun people think stricter gun laws, background checks and waiting periods are an attack on guns they already posses is beyond me. That’s just a special kind of stupid…. which leads to another issue of people trying to convolute problems in order to address real issues. That’s a special kind of evil. Previous articleCritical Mass locks down Miami Beach and nobody knows exactly why and for what. Next articleNRA spokesperson Dana Loesch had a chance to make a difference to humanity and she chose profits over people.